The Public Lands Protection Act, into law. S.B. 50 sends a powerful message that Californians value their public lands and will resist attempts to take them out of public hands and hand them over to extractive industries. If you were one of the people who wrote to or called Gov. Brown or otherwise supported our efforts to pass S.B. 50, thank you — your efforts were successful. 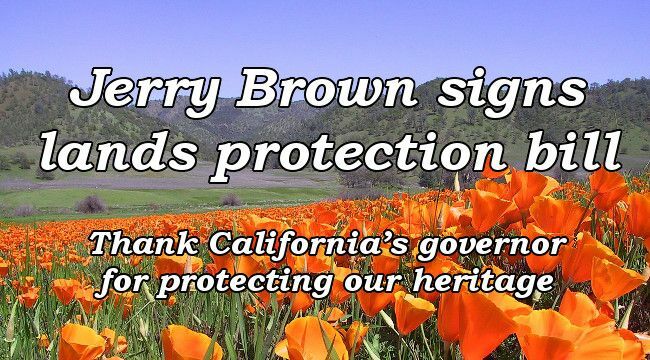 Please take a moment now to thank him for acting to defend California's public lands and wild places. Here is the state legislature's web page on the bill. If you're interested in a detailed legal discussion of S.B. 50 click here.